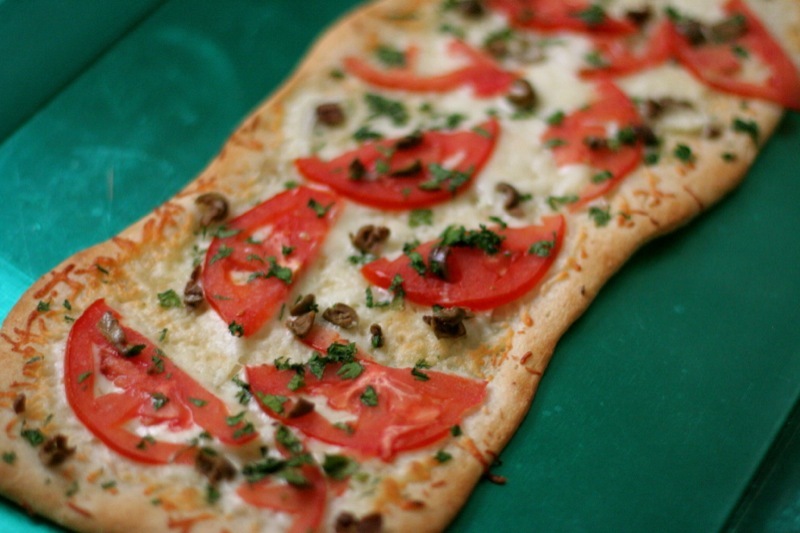 This flatbread have become kind of a staple snack or party food for me. I was inspired by a cheese-and-olive pie that Neomonde bakery makes (and theirs is much better than mine will ever be). The green olives really make the dish – they’re just salty enough. Black olives may be a little too bitter for a delicate flatbread like this. I usually use Roma tomatoes, but today I had one of the big fat ones – just take care to cut it thinly so you don’t have juice making it soggy. If you slice the onions very thinly, they caramelize a bit, which makes a nice sweet contrast to the salty olives. 1. 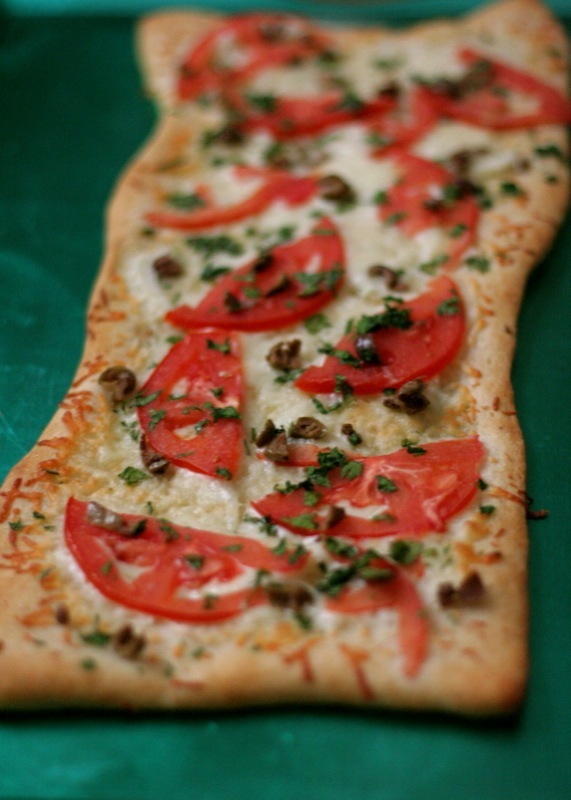 Spread the pizza crust on a baking sheet. Cut in half lengthwise and stretch a little. You don’t need to roll it out, just stretch it a tad bit evenly around the sides. 2. Sprinkle with garlic powder and bake in a 400F oven for about 5 minutes (following the directions on the package for a crisper crust). 3. 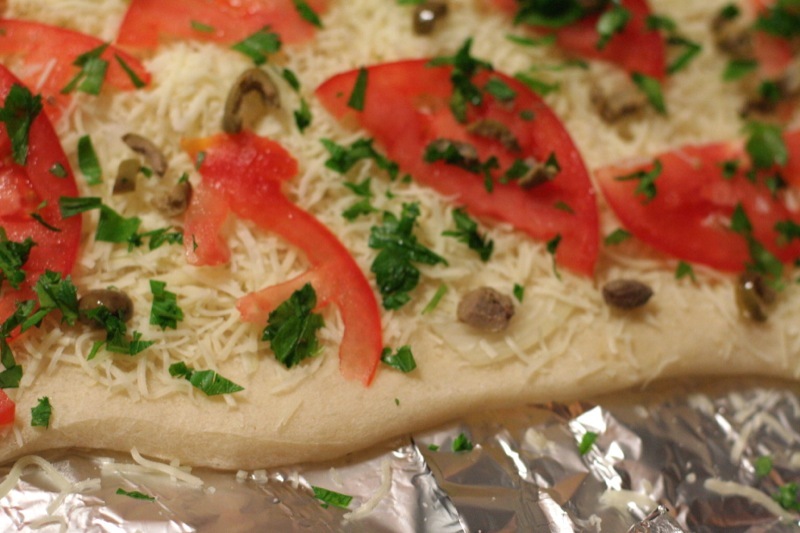 After it is lightly cooked, spread on the cheese, then the onion slices, tomato, green olives. Sprinkle parsley on the top. 4. Bake for 10-12 minutes until the crust is crispy and until cheese is melted (or browned, if you want). Thanks for sharing this delicious treat. It’s quick, nutritious and very tasty. chef dan on I succumb. Quinoa stuffed peppers. Uzzie K on Superhero – My new job, Day 1. Adrienne on Superhero – My new job, Day 1. Natasha on Superhero – My new job, Day 1.